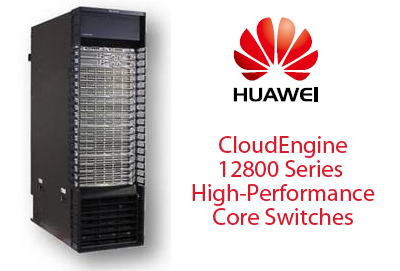 Huawei introduced its CE12816 CloudEngine (CE) switch for the data center core, boasting the largest capacity in the industry at 64 Tbps. The new switch uses Huawei's next-generation VRP8 software to deliver high-performance L2/L3 switching capabilities. Like all the switches in Huawei's Cloud Engine 12800 family, the CE12816 provides support for 1, 10, 40 and 100 GE connectivity. Densities supported on the CE12816 include up to 192*100GE, 384*40GE, or 1536*10GE line-speed ports. "The launch of the CloudEngine 12816 is the culmination of our vision to offer enterprises with an affordable and powerful data center solution that addresses the challenges and opportunities presented by cloud computing and ICT convergence," said Ian Foo, director of Data Center Products and Solution, Huawei Enterprise USA. "Today's announcement underscores Huawei's commitment to lead the industry with innovative solutions that combine high performance with energy saving technologies to greatly reduce total cost of ownership for our customers." Riverbed introduced the ability for cloud providers to deliver application delivery controller-as-a-service (ADCaaS) via its Stingray Services Controller. The idea is to enable an "ADC per application" deployment model instead of today's network-centric model of "one application per ADC box." In today's network architecture, applications and application objects may very well be distributed between data centers and application traffic flows dynamically to/from the cloud. In this environment, Riverbed said it makes sense for the ADC to be near the app objects in the cloud and virtualized rather than dedicated so that they can spin up when demand rises in an elastic delivery model. The new Stingray Services Controller, which is slated for release in Q3 2013, will enable enterprises and cloud providers to automatically provision, deploy, license, meter, and manage their ADC inventory in an as-a-service model. The Stingray Services Controller handles on-demand licensing/provisioning of ADC instances, metering, billing/chargeback, monitoring, inventory and deployment. The Stingray Services Controller enables Stingray Traffic Manager (STM) "micro" instances, which can range from small ADC instances to large Stingray instances all on commodity servers. Linux containers are used to support up to 256 micro instances of the Stingray Traffic Manager per server platform. These can be aggregated to support an infinite number of ADC host platforms. The benefit is that customers do not have to guess their traffic and purchase ADC capacity in advance. Riverbed said its design ensures full isolation and multi-tenancy scaling. "With the emergence of the virtualized data center, legacy ADCs can be a bottleneck and were starting to be excluded from virtualization strategies and cloud deployments,” said Jeff Pancottine, senior vice president and general manager of the Riverbed Stingray application delivery business unit. 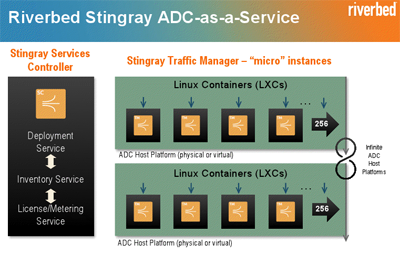 “With Stingray Services Controller, customers will have a hyper-elastic ADC platform that can adapt to workload changes. This is a game changer – today we are introducing a software-defined application delivery fabric that enables Layer 7 services on top of any data center architecture." Procera Networks introduced a real-time, dynamic query capability for network analytics that leverages the deep packet inspection capabilities of its Intelligent Policy Enforcement (IPE) system. Procera said its new PacketLogic Dynamic LiveView enables network operators, cloud providers, and high-speed enterprises to gain customized real-time insights into network behavior. Dynamic LiveView extends the current historic reporting functionality available on the PacketLogic Intelligence Center (PIC) by allowing the creation of customized queries for use in real-time monitoring, dashboards, and network forensics that mix and match data such as subscriber identities, content categorization, device types, network conditions, location, traffic management status, routing and peering attributes, and applications for a real-time view of network traffic. The Dynamic LiveView software creates custom queries on-the-fly utilizing any DPI-collected statistics without degradation of network services. Procera is also making its Dynamic LiveView available via Application Programming Interfaces (APIs) to enable more efficient dashboards and big data reports targeting specific datasets. Hetzner Online, a web hosting provider and data center operator in Germany, has deployed ADVA Optical Networking's 100G coherent solution throughout its national backbone network to respond to fierce growth in video traffic and other bandwidth-intensive applications. The 100G deployment stretches over 470km and connects data centers in Nuremberg, Frankfurt and Falkenstein. Big Switch Networks is collaborating with F5 to automate the configuration of Application Delivery Networking services in private clouds. The solution leverages the F5 BIG-IQ Cloud REST API to integrate the Big Virtual Switch network virtualization application, BIG-IP Application Delivery Networking (ADN) services and OpenStack into a flexible and unified cloud orchestration framework. Big Virtual Switch dynamically provisions virtual network segments, or slices of the network, for applications and workloads and enables automation. The companies said that by combining BIG-IP application delivery resources with network segments automatically, network administrators no longer have to manually define and deploy compute resources and network connections individually. "Inserting ADN services, and doing so automatically, is very important in virtualized network and SDN environments, and can only be achieved with a truly programmable system," said Mansour Karam, Big Switch Networks vice president of business development and strategic alliances. "Big Virtual Switch and BIG-IQ from F5 are both prime examples of programmable systems, and we are enthusiastic about working together to deliver a network automation solution." Cavium introduced a new LiquidIO Server Adapter family designed to support software defined networking (SDN) by cloud service providers, enterprises and private data centers worldwide. Cavium said its LiquidIO server adapters offer the performance required for software based switching and tunneling. The adapters offload SDN and network processing from the main server CPU and are fully programmable to handle expected updates to virtualization protocols. Cavium's new family of adapters includes LiquidIO Server Adapter 210Sv with two 10 Gigabit Ethernet ports and the 110Sv with one 10 Gigabit Ethernet port. This product family is offered in a standard server compliant half-height PCI Express form-factor and is supported by a feature rich Software Development Kit (SDK). This SDK allows customers and partners to develop high performance SDN applications with packet processing, tunneling, QoS, security and metering. The adapter family provides out-of-the-box 10 Gbps OVS, Open Flow, VXLAN and NVGRE tunneling protocol performance. In addition, Cavium said its LiquidIO adapter family has been tested against several commonly used Controllers including Floodlight and NOX. Customers also have the added advantage of being able to run L4-L7 networking & security services on this platform. Several partner companies including PLUMGrid and One Convergence are leveraging this family to offer high performance network virtualization solutions to their customers. “The requirements of Software Defined Networks align very well with Cavium’s strong core competencies of programmability, networking and security. The LiquidIO Server Adapter Family eliminates the performance penalties associated with software only based network virtualization. It delivers high performance with very low power dissipation along with rich software development and application toolkits to enable cloud scale SDN deployments,” said Rajneesh Gaur, General Manager of Cavium’s Accelerator & Adapter Group. 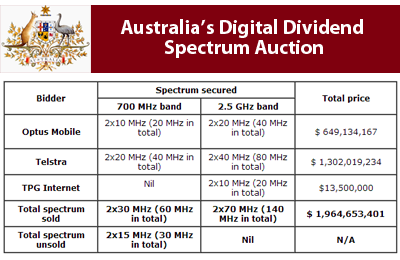 The government of Australia raised A$1.96 billion (US$2 billion) through the auction of 700MHz and 2.5 GHz spectrum. Telstra was the biggest spender, pledging A$1.30 billion in total. “The spectrum purchased in the digital dividend auction and the resulting network developments will greatly advance Australia’s mobile services in coming years,” said Senator Stephen Conroy, Australia's Minister for Broadband, Communications and the Digital Economy. “15 MHz paired of the 700 MHz spectrum, worth in the order of $1 billion, remains in the Commonwealth’s hands for now, and we intend to return it to the market in the next two or three years. Internet traffic into and out of Syria was cut off abruptly at on Tuesday evening at approximately 21:45 local time. 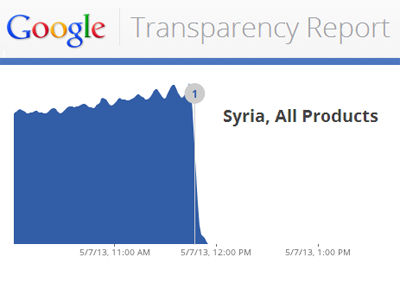 The sudden drop in traffic was recorded by numerous ISPs, including Google's Transparency Report service. No official reason has been given for the outage. The last Internet blackout to hit Syria occurred in November 2012. Polaris Wireless, which supplies high-accuracy, software-based wireless location solutions, closed on a recapitalization of existing equity interests. The company completed a Series C financing with $10 million from Industry Ventures and returned capital to Series A investor Draper Fisher Jurvetson (DFJ). In addition, Industry Ventures Managing Director Victor Hwang has joined the Polaris Wireless Board of Directors. Polaris Wireles also noted that twenty-four U.S. wireless carriers, six managed services partners, and fifteen international deployments now rely on its location solutions to enable emergency call applications, lawful and mass location surveillance, and other location-based services. The company cited a record increase in revenue and profitability in 2011 and 2012. Oclaro reported revenues of $141.6 million for the quarter ending 30-March-2013, compared with revenues of $159.5 million in the previous quarter. GAAP gross margin was 9%, compared with a GAAP gross margin of 14% in the preceding quarter. There was a GAAP operating loss was $28.9 million. 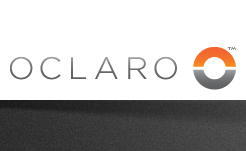 Oclaro also announced it has secured $25 million in short-term bridge loans from Providence Equity Capital Markets, who joins Wells Fargo Bank and Silicon Valley Bank as a lender under Oclaro's existing credit agreement. "Our financial results were at the lower end of guidance for the third quarter, in the face of continued softness in the telecommunications market. Our sales declined further than expected, which drove a higher loss compared with the prior quarter," said Alain Couder, president and CEO, Oclaro, Inc. "The financing we announced today is an initial step in our plan to simplify the company and develop and implement a profitable operating model. Meanwhile our new product innovations continue. At the recent OFC trade show Oclaro reinforced its position as a leader in the high growth 100G market, both on the telecom line side and the datacom client side."